Last night was a family seafood fiesta at my house. My mother in law is a big QVC and HSN person. She bought some Maine lobster tails and some Maryland crab cakes a some time ago. Of course, I was asked to prepare the meal.... Mom knows the thing I love most is cooking for family. And in exchanged for an expensive meal, that was a great bonus! The dinner menu included baked Maine lobster tails, Maryland lump crab cakes, italian roasted potatoes, and best ever corn fritters. Here's how the preparation went- I prepared the lobster tails per the video. I put the six tails in a shallow baking dish. I sprinkled them with sea salt, paprika, and pepper. To the pan I added about 6 oz. of white zinfandel. Next, I lay out the crab cakes on a baking sheet to finish thawing. The seafood would require the same amount of cooking time, about 20 minutes, at 375. I set the seafood aside for a bit. Next, I went ahead and prepared my favorite roasted potatoes. I like to cook them at 350 until they are brown, about 30 minutes or so. I clarified two sticks of butter by heating slowly, skimming the foam, then gently pouring the clear butterfat out of the pan while leaving the solids on the bottom. 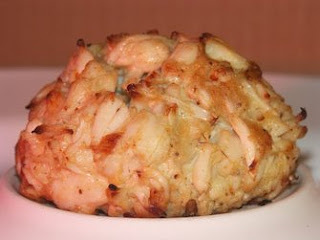 I brushed the lobster tails and crab cakes with clarified butter at the beginning of baking and at the halfway mark. Finally, I made my corn fritters. They are quick and easy, but oh so impressive. So much so that Mom even took some fritters home. The dinner came out better than I could have ever hoped for. Mom ate more than she has in months she said, and hubby was grateful to both of us. In fact he talked about it most of the evening! What a nice mother-in-law you have! Hey Rose, that's how I feel about your cakes! My husband would have been in heaven eating all that luscious seafood!! Wow what an awesome meal!! Oh my gosh I think I've died and gone to heaven! I bought some of those crab cakes as a gift for my MIL/FIL and they said they were good. I never got to try them though. And lobster too! I LOVE lobster. I didn't get the seafood this time because I have a bunch of fish in the freezer already. Can't wait to see your recipes! I'm thinking about picking up the next seafood box though - perch, tilapia and haddock. Just depends on how much fish we eat between now and then LOL! This looks outstanding!!! Thanks for a great dinner idea! That crab cake looks so delicious! I'm a big fan of crab cakes but I never thought to combine it with lobster also.Thanks for the suggestion. hi kathy, just want to thank you for making it to my top 10 ec droppers for april... thanks so much for your drops... keep em coming... :-) see u! hi kathy, i am back here.. thanks again.. cause u made it to my other blog's (www.cahloy.com) top 10 ec droppers for april! thank you so much! keep em dropping! I volunteer to distribute Angel Food in my community. It is a big help to a lot of people. For $30 you get a box of food worth about $60, and the menu varies each month. It’s not just for lower-income families – anyone and everyone qualifies to participate. Local Angel Food host sites are listed at http://www.angelfoodministries.com/hosts.asp. I want to try this. I think I have to wait until we visit the states again. Them lobster tails are to expensive in Japan. Better tell the hubby we better go soon. 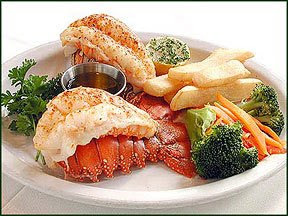 Oh, those lobster tails look so yummy. The last time I ate a lobster was about four years ago. Such a loooong time ago. Thanks for including the lobster tail video. I always wanted to learn how to do that. Can't wait to try it.